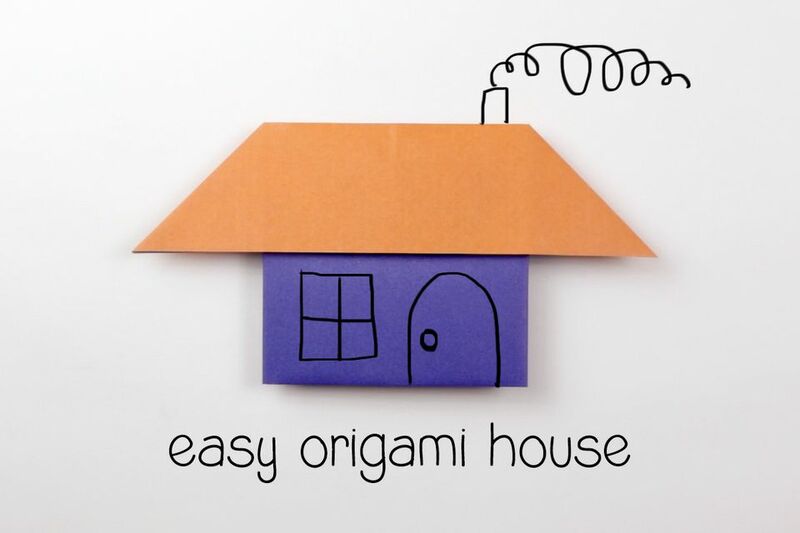 Learn how to make a super simple origami house with these easy to follow step by step instructions. This origami house is perfect for kids to fold. Kids age 4 or older will have no problem with this model, it's so simple. You can add your own window and door like we did or leave it as it is, you can also turn it upside down, and use it as a boat too. For this quick origami house, you'll just need one sheet of square paper. The paper we used is 15 x 15 cm and has two colors, but you can use any kind of paper you like. Start with the paper with the color you'd like on the roof, facing down. (My house will have an orange roof). Fold the paper in half, and unfold. Fold the top edge of the paper down to the crease we just made in the middle. This is what you should have. Flip the paper over, left to right. Fold the bottom edge up to the middle crease. We will be making a small mark in the middle where indicated. Bring the right edge over to the left and align. Don't fold it all; make a small mark at the top. You can see the little crease in the middle. We'll now be folding where it is indicated. Bring the right edge to the mark we just made in the middle. Only the fold the lower section (the blue part in my case). Pull the flap out to the right. You can now flatten that flap. Repeat all of the steps on the left side. You can now flip the house over to the other side, and have a cute little origami house! Why not draw a window, door or more decorations! Loopy Origami Paper Plane Diagram!